As Tunisia’s Prime Minister Youssef Chahed drafted his speech for today’s conference at the Heritage Foundation — where he reassured U.S. decision makers and praised the Tunisian model of democratic transition — his interior minister, Hedi Majdoub, was reassuring police and military officials that “the law deterring attacks on security personnel must pass.” Yesterday, parliament’s Security and Defense Committee agreed to hold a hearing next week for the National Syndicate for Interior Ministry Security Forces in regard to this draft law. The law had originally been put forth in 2015 in response to the terrorist attack at the Bardo National Museum, but was shelved in the face of opposition from activists. The bill aimed to “protect the agents of the armed forces [i.e., armed personnel of the army, the internal security forces and the security forces] from attacks that threaten their safety and their lives in order to ensure the stability of society as a whole.” The law would protect the members themselves, their families, property, premises, facilities and equipment at their disposal, and any national security secrets. Violations — including insulting police or the army, taking pictures of protests, or even publishing reports on security forces’ activities — would result in draconian penalties. * In the midst of both armed attacks against security forces and protests against their excesses, the police and armed forces have brought the bill back to the table. The winds of the Tunisian revolution toppled successive governments but has not changed much within the mindset and reflexes of the interior ministry. Horrifying pictures of a tortured corpse circulated on social media last week, and people accused the police forces of Sfax, a city on the eastern coast, of torturing a man in custody to death. The hashtag “neither Islamic (the state) nor secular, police (state) police (state)” (“لا_إسلامية_ولا_علمانية_بوليسية_بوليسية#”) has been used on social media to collect news related to police violations and atrocities. Two days before a syndicate-led police protest in front of the government’s headquarters, students have organized a march towards the same place in protest against certain measures taken by the ministry of higher education. This protest was faced with much brutality and violence from the riot-police claiming that under emergency-law, any gatherings are potential threat. Days later, the syndicate of armed forces organized a whole-day protest at the same location, and even invaded the hall of the government’s headquarters. 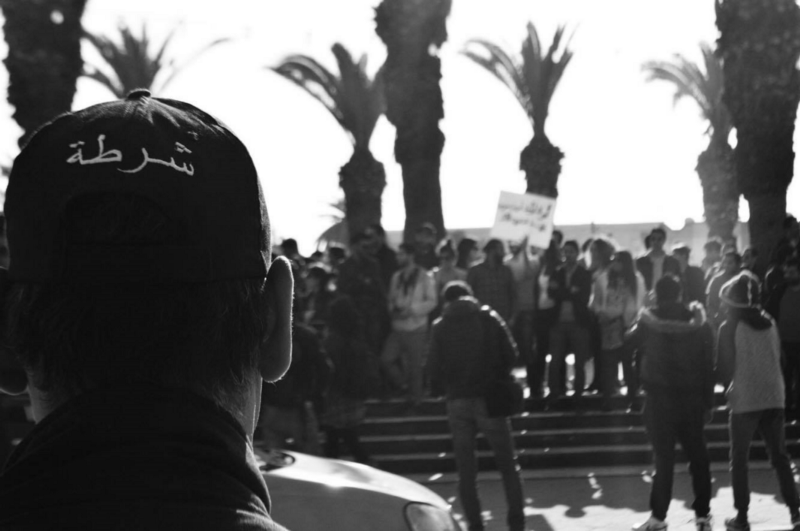 In its latest statements entitled “Tunisia: From Victims to Accused,” Human Rights Watch underlined how the offense of “insulting the police” is now used as a retaliation against citizens in general, but mostly against activists and journalists in specific. Mariem Mnaouer, political activist and chairperson of the Tunisian Party, has been standing in front of the court for months after charges of “assaulting public officers in duty.” Today her case was postponed for the 11th time by the court of Sidi Hsine, Tunis, even though she has all presumptions of innocence. Such attempts to narrow freedom of expression in the public space by attempting to create new laws claiming to “protect” police forces are just misleading. The penal code has enough deterrents to criminals. It would make more sense to suggest the heightening of sentences against any perpetrators of protests or any form of social movements, who cause threat to both civilian protesters and police. * One website, in a bid to highlight the absurdity of the proposed law, featured a calculator where users could select their “crimes” and see what their prison term and fine would be. The page is mostly in Arabic, but can be found here; search “simulateur” to find the relevant portion.